Jamie McKenzie describes what actually happens in most schools and classrooms in terms of questioning. In education, there is often more emphasis on teaching than learning. The current test-driven system, which views teaching as imparting the right answers to the students, often does a poor job of equipping students to find the right question. If as I suggest the true goal of education is inspiring students with a lifelong capacity and passion for learning, it is at least as important that students be able to ask the right question as it is to know the right answer. Questioning comes naturally to children and seems to become a lost art and skill as people age. Adults tend to rush through those steps, perhaps because they seem like second nature. But figuring out what makes a good question—or rather, what kind of question will get us the information we want—isn’t such a simple thing, even for grownups. It requires stopping to think about what we’re trying to find out, what the person we’re talking to might know, and what words we should use to coax them into helping us. Being good at asking questions is the art of identifying those gaps, sorting them, and figuring out how to fill them. Considered that way, it is a strange skill: “the ability to organize your thinking around something you know nothing about,” said Rothstein. I believe most educators would agree that learning to compose a good question is a skill students should possess. There is evidence that the art of asking a good questioning is a skill that most adults do not possess and that schools are not doing a good job teaching. There are some classroom activities educators can do to teach questioning techniques. 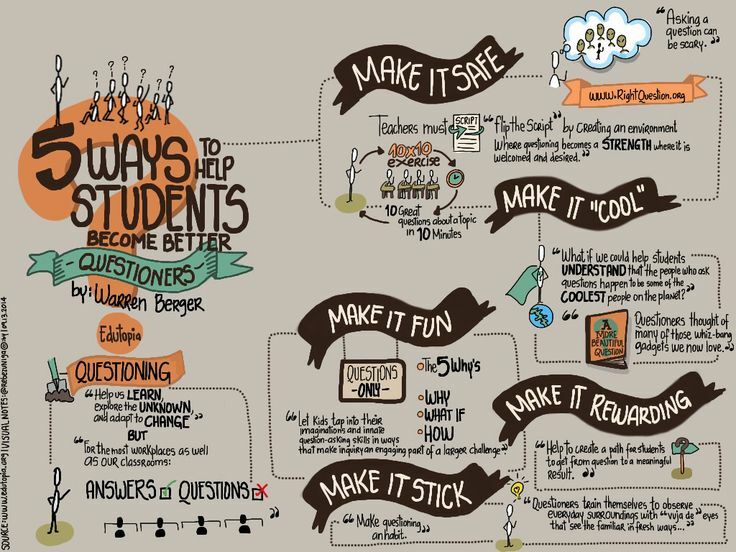 In an Edutopia article, Warren Berger proposes 5 Ways to Help Your Students Become Better Questioners. Jamie McKenzie, Ed.D. and Hilarie Bryce Davis, Ed.D. propose in Classroom Strategies to Engender Student Questioning some of the following activities to have students generate their own questions. Begin a New Unit with Students Developing Questions: Try starting a new unit by asking your class to think of questions that could be asked about the topic. Create a Taxonomy of Questions: When students begin to label the different kinds of questions, they learn to select different kinds of questions to perform different kinds of thinking. No matter what the level of schooling, some kind of label can work effectively. ask a question that is the child of a bigger question that they can then ask the rest of the class to identify. Step 1: Teachers Design a Question Focus. The Question Focus, or QFocus, is a prompt that can be presented in the form of a statement or a visual or aural aid to focus and attract student attention and quickly stimulate the formation of questions. The QFocus is different from many traditional prompts because it is not a teacher’s question. It serves, instead, as the focus for student questions so students can, on their own, identify and explore a wide range of themes and ideas. Step 2: Students Produce Questions. Students use a set of rules that provide a clear protocol for producing questions without assistance from the teacher. The four rules are: ask as many questions as you can; do not stop to discuss, judge, or answer any of the questions; write down every question exactly as it was stated; and change any statements into questions. Step 3: Students Improve Their Questions. Students then improve their questions by analyzing the differences between open- and closed-ended questions and by practicing changing one type to the other. Step 4: Students Prioritize Their Questions. The teacher, with the lesson plan in mind, offers criteria or guidelines for the selection of priority questions. Step 5: Students and Teachers Decide on Next Steps. At this stage, students and teachers work together to decide how to use the questions. Isn’t this a skill we want our learners to develop? Thanks for sharing this, Jackie. I’ve been following Jamie McKenzie for years. He created a whole site dedicated to questions http://questioning.org. Here’s a link to his 1997 Questioning Toolkit that explains, analyzes and exemplifies different categories of questions: http://fno.org/nov97/toolkit.html. It’s a helpful starter in addition to your excellent article. Thanks for adding another resource, Steve. I hadn’t heard of Jamie McKenzie prior to my research on this topic. His work is great – had a great vision of being information literate in the information age 15 years ago! 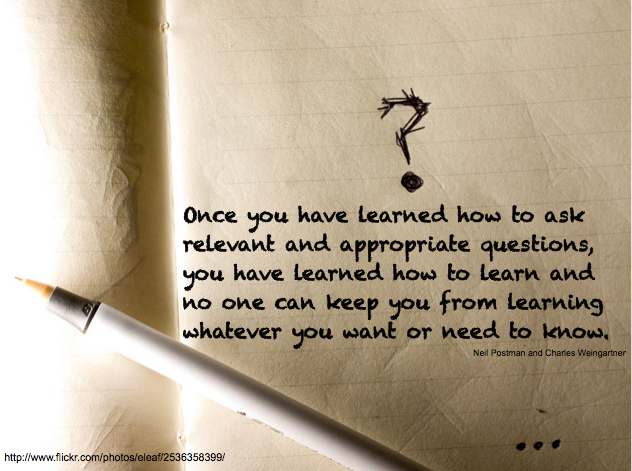 Yes the skill of asking good questions is an important one for teachers and students. Thanks for the overview Jackie. You may not have heard of Peerwise, developed by a New Zealand academic at the University of Auckland, where students can not only develop questions on a topic but also rate each others questions and follow people who are writing the best questions for their topic.And it’s free! I’ve just discovered your blog through a ELT tweet and think it’s fantastic. I look forward to being a regular reader. Thank you for your efforts. They are appreciated. Jackie, thank you so much for sharing this post. I, too, agree that students should generate their own questions. Creating inquiry around learning isn’t something that should be limited to teachers. Students need to engage in this practice as well. Your post reminded me of Perkins’ comments in Making Learning Whole. Perkins basically notes that he needed to practice more problem-finding, not problem-solving. Thanks for sharing and refining my thinking here! Thanks for this post. Like Julie above I am hoping to present similar ideas to colleagues in order to help to improve our students learning. Thanks for sharing this post, Jacki we are always looking for many ways to improve our students learning and creating the best essential questions on major issues, problems, concerns, interests that relevant to students’ lives and to their communities and with your post, you are helping the educators to learn more and encouraging them to search for good essential questions in order to open-ended, meaningful and purposeful with emotive force and invite an exploration of ideas. Research questions that learners are passionate about and want to answer–are those user generated essential questions? All any student needs is enough education/training to begin work, be able to ask an intelligent question, and recieve information to get to the next level or completion.